I'm on a bit of a hummus kick lately. I recently posted this roasted butternut squash hummus and that was super delicious, but apparently did not fully squash (pun intended) my hummus craving. 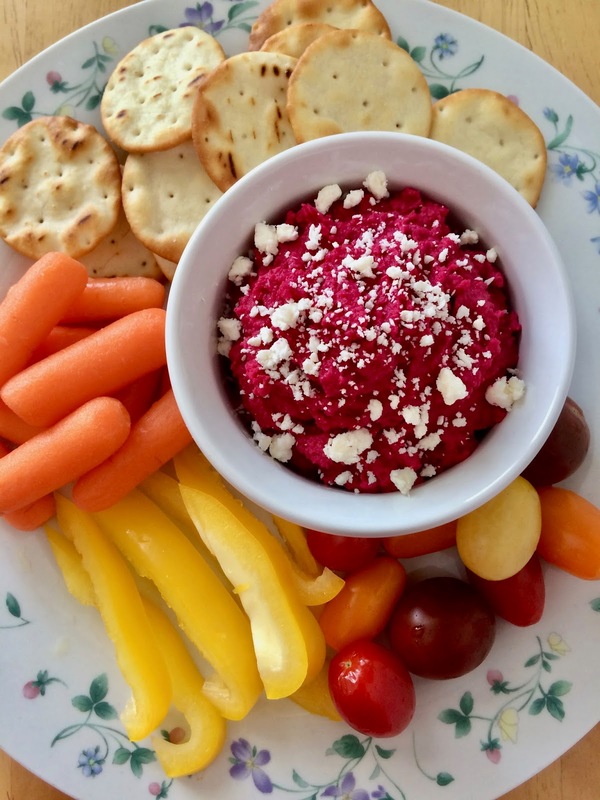 This time I decided to try hummus made with beets. A friend had shared a beet hummus video with me about a year ago I've been meaning to try it and now I'm wondering why I waited so long. It's delicious and also, that color! I mean, it's so so pretty! I don't know how anyone could look at it and resist giving it at least a little try, even if they aren't huge beet fans. I didn't use a ton of beets in my recipe so it wasn't overly "beety" in flavor, but rather had that slight earthiness that beets impart. My husband and I have been eating it like the photos here and my mom and I enjoyed it on some corn tortilla chips. The kids have been eating it spread on crackers with a side of sliced grape tomatoes and pears. Everyone has been eating it and liking it! It's delicious for a light lunch or snack or an appetizer/side dish to a larger meal. Steam or boil the beet until fork tender. Remove the beet and reserve cooking water. Let the beet cool and then place it in a food processor along with the garbanzo beans, tahini, garlic, and lemon. Pulse on high until smooth. Add a little cooking water if too thick. Add salt and pepper and pulse. Taste and adjust as needed. Transfer to a bowl and top with the feta. 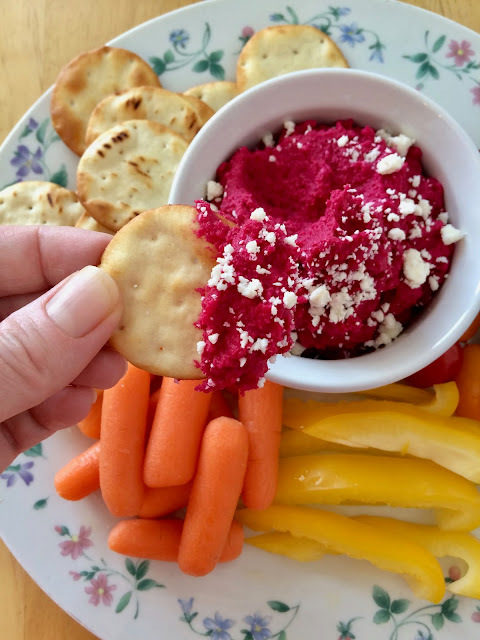 Serve with pitas, pita chips, crackers, or tortilla chips and/or fresh vegetables of your choice (carrots, cucumbers, bell peppers, grape tomatoes, celery). Store in a covered container in the refrigerator for several days. What a fantastic colour! Love beetroot, hummus and feta so I know I'd like this. Gorgeous colour and I love its creaminess too. That color is gorgeous Amy, so cool that your babies are eating it too! never had beets like this before, will definitely have to give this recipe a try. Beets are so good for you! I love to see them in a recipe. I do notice a difference in my energy level when I eat beets or drink real beet juice. Thanks for sharing your recipe on Foodie Friday! Such a neat spin on hummus! PINNED! 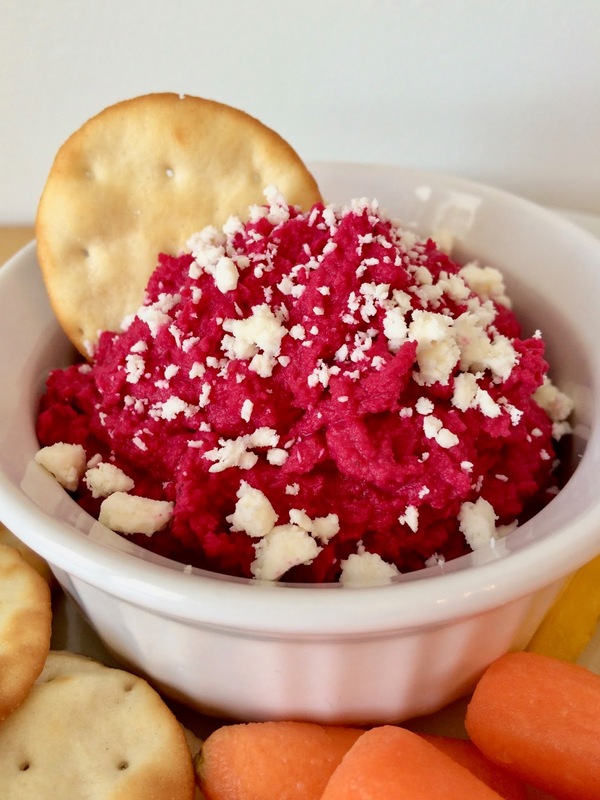 This is a first for me...beet hummus...it does sound pretty yummy though!!! I never used to like beets or chickpeas, but now I like both, so bring this dish on! Wow this looks great! I have never seen beet hummus before, what a great idea. I can't eat chickpeas much unfortunately, but if I was going to eat some hummus this would be worth it (the digestive pain--ugh!). Love the feta on top. And I'm in love with that gorgeous colour!